If you are thinking about getting a pet bunny or already have one, it's important to understand that they are very smart little critters. Bunnies like dogs need things that keep them busy throughout the day. Not having mental stimulation can lead them to become bored, stressed and potentially destructive. So how can you make sure your bunny, either indoor or outdoor gets everything it needs to stay happy? While pet shops stock all the things you need these kinds of things can get quite expensive.With a bit of research and DIY, it's possible to find the right enclosure straight up and get all the toys, chew toys and brain busting things you need without breaking the bank. Choose an enclosure where the bunny can stand on their back legs without hitting their head on the top. Even better if your enclosure has multiple levels to keep the bunny active and work their muscles. Try to give them as much time as possible out side the enclosure whether its in a run outside on the grass or indoors in a bunny proofed room with a range of toys. Always rotate the toys for the bunny. Like children, if they have access to the same toys all the time they won't appreciate them and will get bored with them quickly. Chewing is a necessity for a bunny. Unlike humans, their teeth grow constantly and chewing is what they do to wear them down. Being able to dig is also really important. It's something they want to do naturally but it also helps wear down their nails. If you have ever been scratched by a bunny this might now be at the top of your list! If your bunny is indoors you could consider giving them a towel that they can "dig" in or their own little sandpit or flowerpot of soil and grass. If they are outside, make sure that they get some time out on the ground. Sitting outside in a wire cage all the time just looking at the yard is going to send them crazy. Pinecones are a fantastic chew toy for bunnies. Just make sure that wherever you pick them up from you treat them as best you can to remove any potential sprays and sap. Scrubbing them in hot water and vinegar and then baking in the oven at 200 degrees Celcius for approximately 15 minutes. Hanging them in the enclosure gives them a double challenge as the pinecone swings and they have to find a way to steady it. Pieces of cardboard or big phone books are perfect for shredding and ripping. They are challenging to the bunnies and while a little messier than other chew toys, bunnies clearly love them. Be sure to pick untreated/ ink free cardboard to avoid any toxins being ingested by the bunny. Wooden blocks ( untreated) or sticks are great because you can poke them through the cage bars at different levels so the bunnies can chew on the ground or reach up for them and get a good stretch. If you aren't sure what's safe for bunnies ask your local vet clinic to confirm what is and isn't toxic to your bunny. The best toys for bunnies are cat toys from the dollar stores. Balls, or jingling balls that they can push around, provide hours of entertainment. 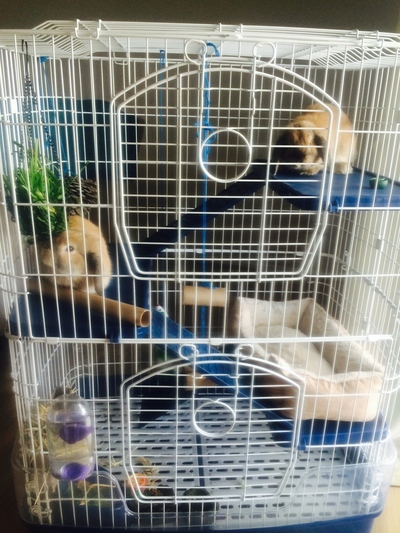 Don't limit their placement to the floors of the hutch or cage. String them up so they can swing them around or bounce them off the sides. Use lids from bottles for them to stack and knock over or flick out their mouths. Giving them boxes with holes of various sizes cut in them gives them the challenge of trying to fit through and working out which ones they can and which they can't. You will often find that they really think about the structure and will chew the small holes bigger so they can fit through them. It's a great way to engage their brain and body at the same time! Cat tunnels are also a great activity and the Y shaped ones give them multiple tunnels to chase each other in and out of. Instead of just giving your bunny their food in a bowl put a piece of string across their cage and peg different pieces of food up. It means they have to move from peg to peg and reach for the food. You can also hide tidbits of food inside toilet rolls so they have to roll it around or chew through the cardboard to get their food out. Bunnies like to graze throughout the day so keep a unlimited supply of hay or grass in their enclosure. To keep it tidy you can make a hay station by using a cardboard coffee cup holder and stuffing it with hay and fixing to the side of the enclosure. Implementing these things will leave you with one pretty contented bunny!